History cannot be erased or sold. Has Bob gone nuts? Why is he posting pictures of hypermarkets? Some who know the history may already know the answer. Stick with me and all will become clear. 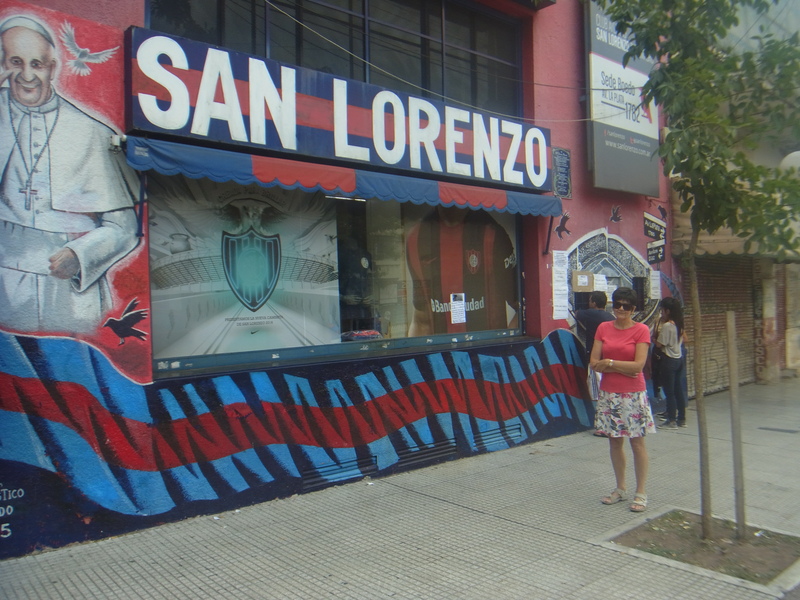 The Popes favourite football team is San Lorenzo de Almagro. For some reason I have yet to figure they were not popular with the military Junta in the seventies. So they sold the land on which the club stood to Carrefour. The club had to move out to Flores far away from its home base. 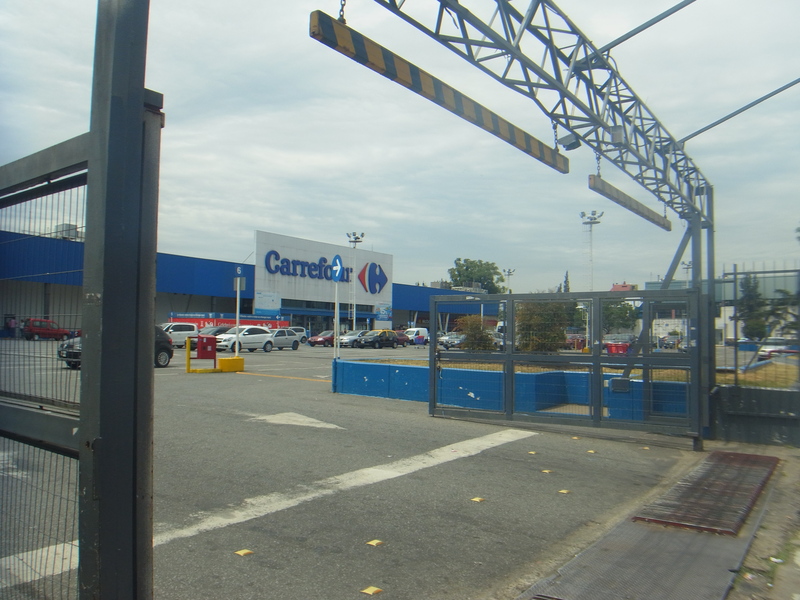 Now after years of wrangling Carrefour have agreed to sell the land back. So you see, I have taken a photo of a building that has been condemned. There is still a club shop and Gymnasium here though. Many will know that I am not a great football fan, but something in this story has touched me. May be it has something to do with its proximity to me, maybe its sudden resurgence with the Popes blessing, or maybe it is just another injustice done by the Junta which is about to be righted. On a side note, we saw a guy carried out of the Gym to an Ambulance, and we were only there twenty minutes. Bloody Gym is no good to anyone, I say. We went inside and ordered coffee. Obviously they did not want us to spend too long there with just café con leche. The music changed to some modern bass singer who droned his way through old classics, making them hard to listen to and, had we the space and inclination, impossible to dance. Shame we were enjoying the ambiance. Still it was a good day of wanderings, we found little new, but got totally immersed in tango culture, and a sense of a traumatic history. Viv has had me doing domestic stuff today, so our adventures are limited. But we did go to Plaza Almagro and sit in the sun eating some excellent neo italiano ice cream. On the way there we pass a vacant lot. It has been vacant ever since we have been coming here but now I have noticed this. Basically they are building a recreational space two doors down from us. I don’t expect to see it this time, but hopefully we will have what is in effect a garden on our block by next time we come. The old guy was at the door again in Fulgor. It is little wonder that the numbers are down. Every time I come he tries to block me, this time he sat cursing and muttering because I gave him a $50 note. Somebody at some time has to give change and how difficult was it for him to give me two $10 notes? It got me thinking, what made me come back after the first time? We were treated like naughty children and made to sit at the back. The dancing here is no way puro tango and it is a fair old walk every time. I guess I will never know what made me return, but now we are part of the furniture. I suspect we will still be coming here when the old guy finally has his way and no one comes through the door again. I suppose you could call this a wasted day, but then we are on holiday and are not short of time, so my days are mine to waste as I feel. Anyhow the best laid plans of mice and men, you know how it goes, so instead of our plans we set off for Plaza Almagro. It has been one of my favourite spots since I first discovered it. Nothing fancy just an area of green where flat dwellers go to exercise their kids, stretch out in the sun or play games. And they have catered well for the games with a boule pit, chess and dominoe tables and large areas of grass. We took some bread bought some drinks and empanadas from a local bakery, just sat in the sun eating drinking and reading. It is a public holiday tomorrow, I have no idea what for, not that they need much excuse here. There is a street party going on just up our street where lots of noise is generated and it seems everyone is out enjoying the sun and the fact that tomorrow they do not have to work. The park is packed, people are out, music is playing, the sun is shining, and for once the traffic is quiet. There has been much talk of “friendly Milongas” for us this can only mean Club Fulgor. We returned here again after four months and people actually said “You said you would be back in October”. As we walk in Roberto rushes across to greet us then Adriana, hugs kisses handshakes galore and we were barely through the door. As the night went on more people came over who remember us, all wishing us well and asking how we were. When I danced again with Norma, she as always went over to Viv to thank her for letting me dance with her. Though actually, I think she is glad of the rest. This place is not pura tango, they play jazz, cumbia, rock and roll, but there are no pretentions here, everyone is just here to have a good time. We have yet to get fully into the Buenos Aires night-time living and by midnight Viv was tired so we set off back home, tired? yes but happy that again Fulgor had lived up to its reputation as the party spot for us oldies. We landed in Buenos Aires to a beautiful blue sky. There was the occasional wisp of puffy cloud overhead, the forecast had said cloudy I guess the argentine idea of a cloudy sky differs from what it would be in the UK. It was a genuine relief to get off the plane. Because we had bought from a bucket shop this time we had no choice of seats and we could not get out to walk around. Not that that would have been possible for most of the journey because the seat belt sign was seldom off. We usually get some turbulence as we cross The Atlantic but the intercontinental convergence zone was tonight really living up to its name and, I think, trying to expand its empire. It never used to frighten me it was just the inconvenience of not being able to pour a drink and leave it or catching your coffee before it becomes a part of your clothing, but that was before the Air France flight from Rio last year that disappeared from the radar behind us. They still do not know what happened and until they do it will always be a worry to me when we get tossed about like this. Still we are here now the sun is shining even though it is only eight in the morning, we cleared customs quickly and it was just the job of choosing a Remis next. Remis is what they call private hire cars here, they are strictly regulated so that they are the safest way to travel. There is a whole line of booths at the airport arrivals hall and I always go down them all to check who is the cheapest they vary from $118 to $140 which is a difference of about £5 but every little helps and by the time you have tipped the porter, the driver, and the guy who holds the doors open, you are not far short of£30 for the journey from the airport. 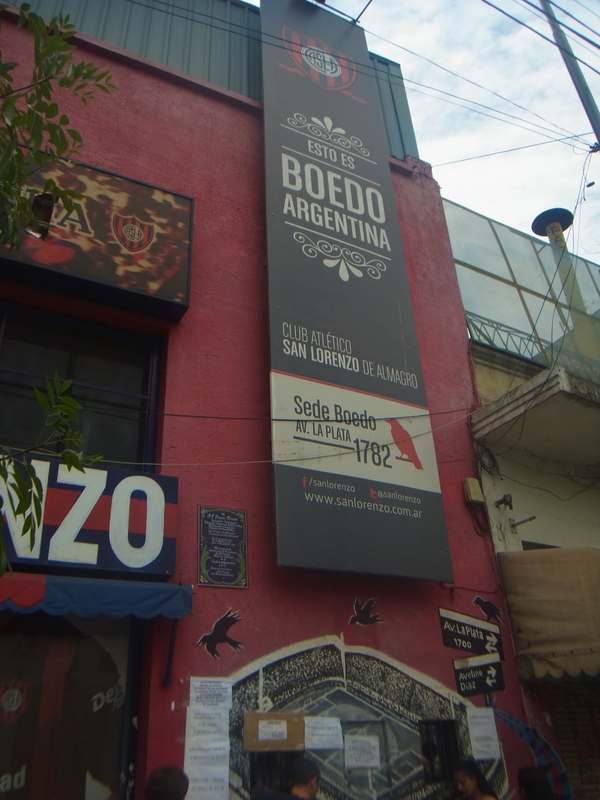 It is a great feeling now that we know where we are all the time, as the car turns of the autopista at Boedo and turns into Columbres I can name most of the intersections and when we cross Rivadavia I know we are on Salguero and only eight blocks from home. The sight of Plaza Almagro, as we pass, is always welcoming for then we know we are on home soil. Philippe has left the place pristine as usual, but that does not stop Viv wanting to clean as soon as we arrive. All the clothes are packed into the wardrobe, cases away and sorted by eleven, so after a coffee it is down to the supermarket for some provisions. We have already been in touch with Janis, had a light lunch from the vegetarian chinese takeaway opposite and are ready for an afternoon nap. It is after all twenty-four hours since we got up so it was badly needed. Later we explored a bit more, most of the shops were closing up now but Viv wanted to find a vegetable market we had seen before. 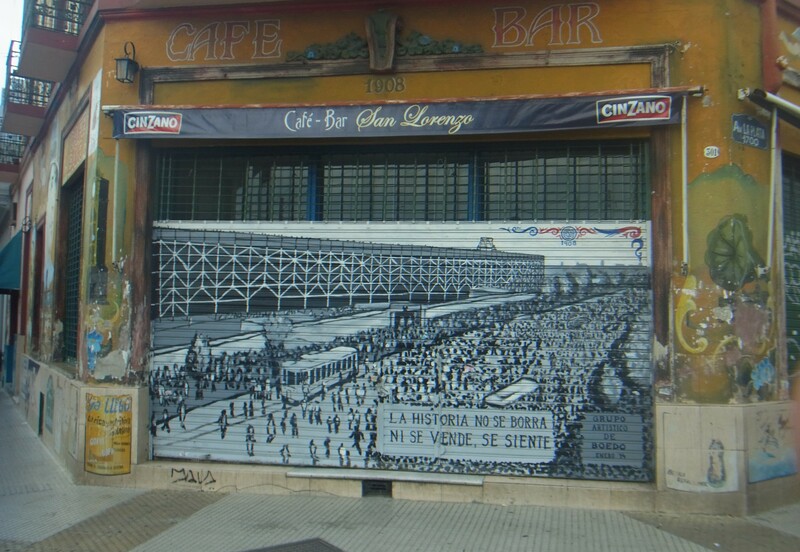 Firstly I wanted to find what had become of our favourite panaderia. (See Back again in Buenos Aires) There were shutters on the front which were down, but they were not completely closed. So crawling on the pavement I peered underneath, lo and behold, yet another chinese supermarket. Just what we don’t need. Tonight we went to Salon Canning, not one of my favourites especially on Saturday, but we were invited and after a very long tiring day, it’s close. 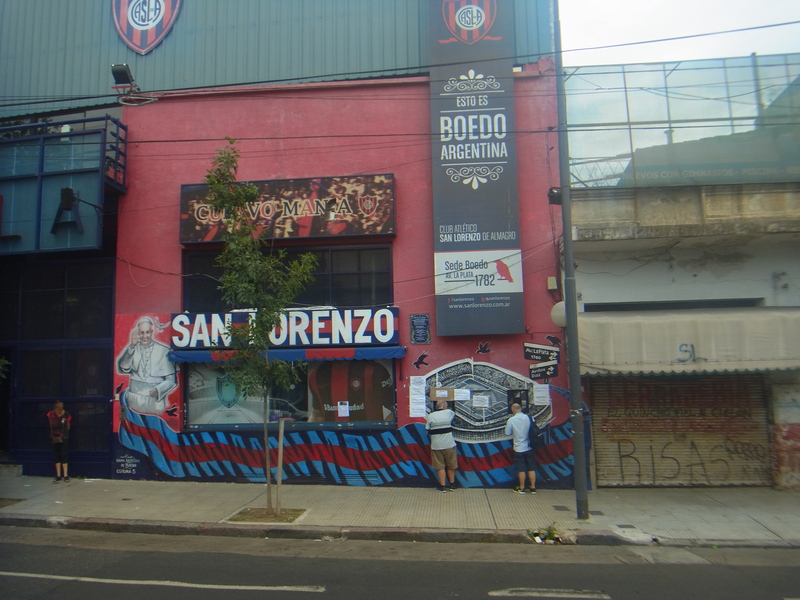 You get fussy when in Buenos Aires, stuck in the tango desert of N.Wales I would love this place, but here? well there is so much other choice. Here they are not a crowd where we are known so we had to put up with many attempts to drive the extranjeros into the middle of the floor where they belong. I have been coming here too long now to allow this, but one guy just kept pushing and I just kept giroing until there was the inevitable collision. His partners ruined shoes she seemed to think were my fault, but when you run into the people in front, you should look to your driver. They gave up and changed lanes. The other thing I don’t like here are all the cameras, I guess touristas ( we were there ourselves once, some would say we still are) have to go somewhere, but one couple had brought an entourage with them, complete with lighting set up. Two camera men would take pictures of the floor then arrange the couple for a shot with the champagne then some more of our feet, they seemed to be enjoying it, but it just looked boring to me. When one of the cameramen (woman actually) sat on the corner of the floor taking pictures it seemed to cause chaos. Some stopped to pose, some tried to get out-of-the-way, others just got flustered. Why do they not just dance? It was all too much after a long day we had had enough and it was time for bed three hours is enough for our first night. Funny how when we have a late night we seem to get up early, yet when we have a relatively early night, like last night, we get up late. Viv calls it demand sleeping it is certainly better than getting up to an alarm clock. But getting up after mid day leaves little time to get into the city or do anything touristy, still I keep telling people “no somos touristas” so I suppose that is fair. Anyway I had to repair the sink today and as all my tools are seven thousand miles away, it makes life interesting. Afterwards we went walkabout and found yet another dance shoe shop, they are springing up like mushrooms around here. Then the munchies got me so we bought some drinks empanadas and pan queso and sat in Plaza Almagro watching the kids play, the oldies just sitting and a couple of blokes playing chess. It is one of the quirks of the city, in their common spaces they have concrete tables inlaid with a chess board, in the summer there are tournaments and people playing chess everywhere, though it is less common this time of year.Plaza Almagro is a lovely green space in the centre of Almagro surrounded by traffic but the trees keep the noise level down. The pigeons were showing too much interest in my bread, we had bought very little and I was not feeling generous, so they went hungry, despite one cheeky fellow jumping onto our bench inches from me and giving me a sideways look. After another trip to the supermarket and an afternoon nap it was down to the subte and off again to Plaza Bohemia. Once there we were greeted as old freinds by Gloria and soon we were dancing to some wonderful tandas put together by Adriana. The sparsity of dancers that seemed to have occurred here on our last visit had ended and we had agood crowd although it was still easy to dance. I did have my doubts about returning here but I am glad to say they were ill-founded. There was some interesting dancing here tonight, a woman leading, a man following, Gloria does have some contact withTango Queer so that could explain. There was an american couple who sat opposite sides if the room to dance with different people, you could tell that they were a couple though. These were smartly dressed and danced well, I was not so impressed with the Yanquis in Jeans, I think it shows no respect for the other dancers, the organisers, or the great musicians who created this wonderful sound. We had a demo again, this is becoming almost mandatory, these two were good. She was heavily pregnant so acrobatics were out anyway, but they were incredibly musical and the footwork was brilliant. I hope that when she is not pregnant that they still dance this way, acrobatics are for the circus. There was yet another birthday celebration, much singing “Cumplianos Feliz” and torta then time for bed. 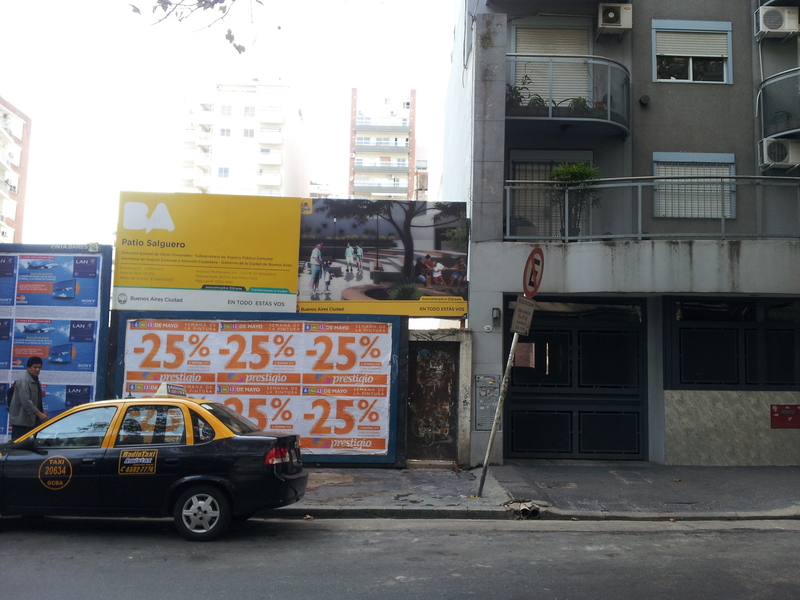 We have developed a strategy here to avoid being ripped off by the taxistas, we walked across 9 Julio into Lavalle. Lavalle runs out-of-town so when we raised a taxi I just said “hasta Salguero” he thinking I did not know what I wanted asked ” Y que calle” I just told him Lavalle. This takes me only one block from our apartment and he does not have to turn off once, so he cannot give me the grand tour. It is sometimes hard to live like this but the tourists are seen as an easy target. You don’t get me, not tonight any way.